Bamboo is very versatile and widely used for every day materials and products in rural areas of the countries of origin. Bamboos are fast growing, with most species being harvested in 3-5 years, and some species reaching maturity in a year. It is therefore a low cost material that is strong and durable and can be used for just about anything from house building to functional and decorative objects such as bamboo pots! bamboo rice steamer, chairs, stools, fountains, hats, baskets, mats and rugs, beds, cups, bowls, pots, eating utensils, chopsticks, fishing traps and rods, boats, carts, musical instruments such as flutes, and toys. 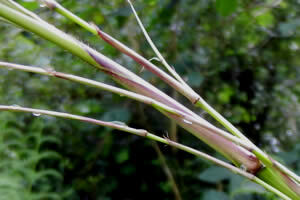 For example, Chimonobambusa Tumidissinoda is a species that is traditionally used for making walking sticks in China. With treatment, bamboo forms into a light, exceptionally durable, and very hard wood that is tough enough to be used for constructing dwellings, furniture, scaffolding, flooring, roofing, and many other bamboo projects. Bamboo is so flexible it can bent into round and curved shapes without breaking. It can also be forced into different shapes when it is growing, if the young shoots are grown through a square tube for example... or curled into a corkscrew shape. 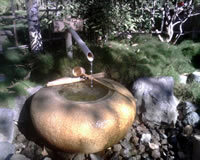 Examples can be seen in the shapes of 'lucky bamboo'. Although these plants are not actually part of the same family! Bamboo canes are smooth so, unlike wood, they don't need to be stripped for craft-work. The canes can be split to make them flat for a variety of project requirements. One of the most common bamboo crafts is probably basket making. This is certainly popular in Japan with different styles, types, and designs according to area as well as skill. For example, Samurai warriors were reportedly the first to make the Suruga baskets (originally from Shimizu) with a combination of round bamboos for the sides and woven flat/split canes for the bottoms and lids. Other baskets are designed using flat splints from split canes, woven into intricate designs or fairly plain and practical, most often natural colours but sometimes dyed. Another of the original bamboo crafts is the making of cages for birds, insects, and other animals. There are some really beautiful carved pots, visit my page on bamboo pots for more about uses and antique carved Chinese brush pots. Visit my forum page for a list of discussion groups and forums that you can take part in or look for advice on craft topics. bamboocraft.net forums are a good place to start. Look for the Bamboo Arts & Craft Network Cummunity, Bamboo Workshop for workspaces, tools, equipment, processes and techniques, and Bamboo Flora for discussion about flora & fauna from around the world.